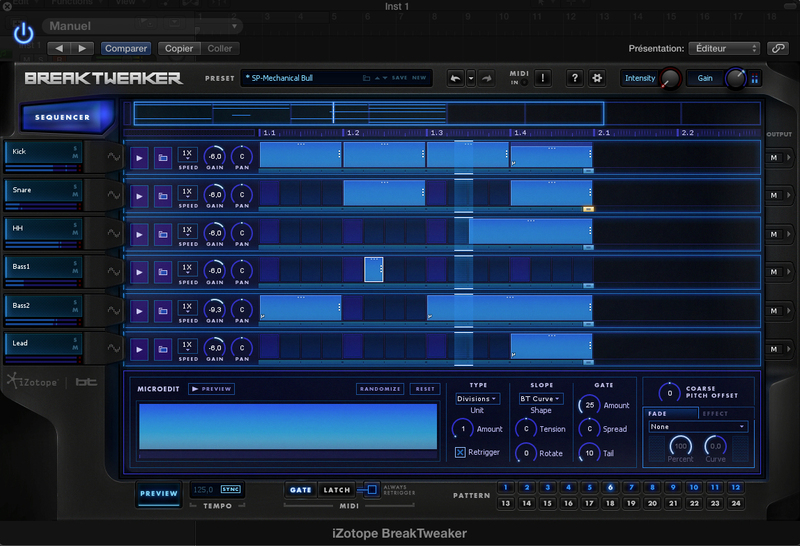 BreakTweaker, Virtual Percussion Synth from iZotope. Partnerships between celebrities and manufacturers are common in all domains of industrial and cultural production. Most of the time they result in aggressive marketing campaigns and advertising, and the collaboration can be often summarized as the reciprocal lending of each others' image and notoriety. Sometimes, the collaboration is done discretely, and it is only years later that you find out that such and such has proposed, invested or co-developed an industrial product or, in the field that concerns us, an instrument or software. Some other times, the collaboration is well known, it grows into a serious partnership and, to stay within the musical domain, the artist can become a real source of inspiration, helping define technical specs and taking part in the fine-tuning of a product, especially when it comes to the design, be it the neck of a guitar, a GUI, a keyboard, a virtual drum head, etc., becoming a true endorser of the end result. A case in point is Lester William Polfuss, aka Les Paul, and the evolution of solid body guitars and multitrack recorders (do we have to say whom he worked with, even if the importance of his collaboration is questioned by some authors? ), or Stevie Wonder and samplers (with his demands to Ray Kurzweil), Bill Bruford and electronic drums (given his relation to Simmons), Annette Peacock and synths (including the use one of the first Minimoog prototypes on stage), Steve Vai and the development of seven-string guitars (together with Ibanez), and many others that you will surely help us with in the forums. The software we will review today, BreakTweaker, is the outcome of the collaboration between Brian Transeau, aka BT, and US software developer iZotope (some of whose products have been reviewed by us, like the RX3 and Iris), after the latter acquired Sonik Architects, the music technology company founded by BT in 2010. 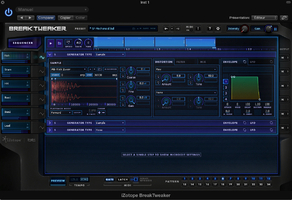 BT is the inventor and undisputed master of the Stutter Edit production technique, and the first collaboration between him and iZotope was a plug-in by the same name. 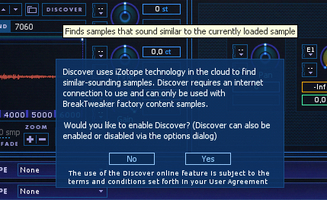 Their new tool is called BreakTweaker, a name that should be familiar to those up to date in terms of music production, considering it's the name of the software BT had planned to release, and the reason why he created his company in 2009. BreakTweaker is Mac (10.6.8 and higher, on Intel processors only, so an old G5 won't do) and PC (from XP SP3 onwards) compatible. It's available as a plug-in in almost all major formats (AAX, RTAS, VST, VST3, and AudioUnit). It comes with 2 GB of drum and percussion samples for any genre, both acoustic and electronic. The installation is smooth, the sound library can be downloaded using a download manager or directly from the publisher's website, and the authorization is done via iZotope's server, as usual, with the choice of HDD (hard drive) or iLok authorization. Sold for $249, you can buy it directly from the publisher. There is also an Expanded version available for $299 that provides three complementary Expansions: Vintage Machines, Cinematic Textures, and Kick & Snares. First major drawback: There is no standalone version, so you will be forced to open a host software to use it, a real pity. The interface is a strange mix between iZotope's usual finesse and transparencies and a much more "rustic" graphic style, as if it was inherited from a previous version. But let's not linger over insignificant details. 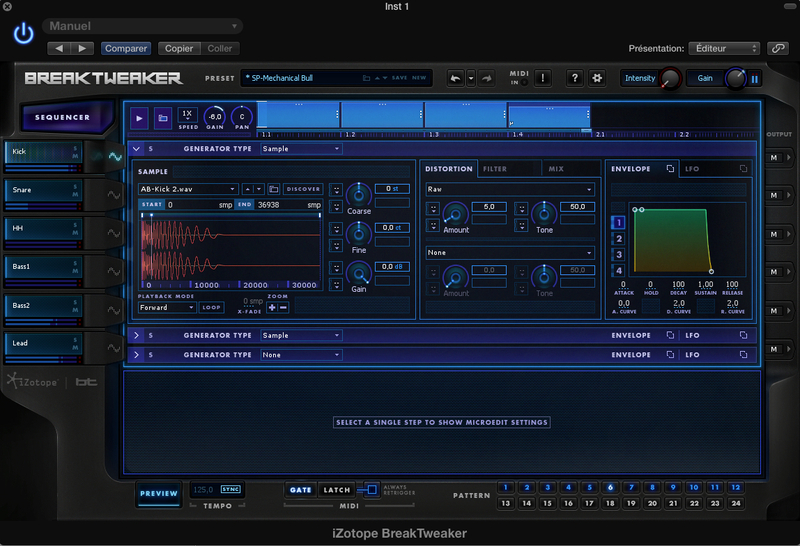 BreakTweaker is divided into three parts: sound generation (consisting in Generators), sequencing, and micro-editing. Naturally, each of them offers (almost) unheard-of possibilities ─ what would be the point in bringing out yet another drum machine? And doesn't "MicroEdit" sound alluring? We'll get there soon enough. 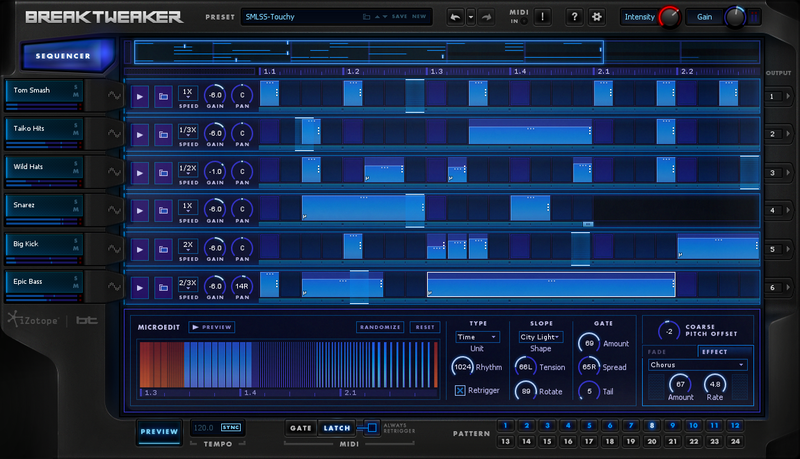 The plug-in features a sequencer with six independent rhythm tracks, which can manage any type of sound. Sounds are, in turn, produced by a generator that uses both samples and synthesis and, finally, there's the micro-editing module to apply (among others) the Stutter effects so dear to BT. Let's start with the sound module. The first excellent idea, in terms of usability, is that the programming options of the Generator are displayed above the rhythm track, so you always have an overview of the sequence. Second good idea: the availability of three sound engines per sound, which can be used simultaneously. 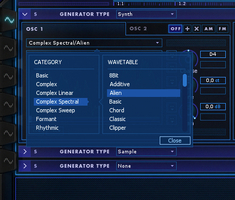 You can choose a sample reader or a pure synthesis engine independently. In the first case, you have at your disposal a browser to load samples from the factory sound set (or your own) and, eventually, enable the Discover mode, which will also look for similar-sounding samples in the sample library. You can modify the starting and ending points, loop the samples (which activates an adjustable crossfade) and define the playback mode (forward, reverse, forward-reverse, and reverse-forward). There are three knobs that allow you finely or coarsely tune the samples and adjust the volume, respectively. These parameters can be modulated by two sources simultaneously, whose range of values is adjustable. 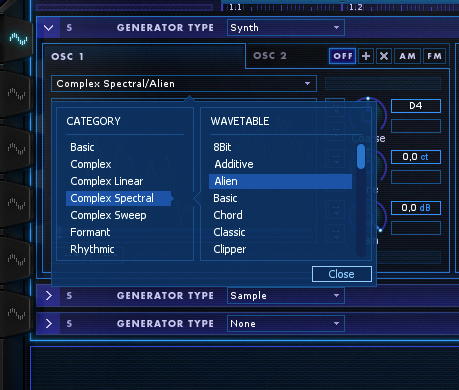 They can also be found in the synth module. The latter provides two oscillators with loads of (sampled) wavetables, all of which can be modified by the Shape Slider (also capable of being modulated by two sources). The latter allows you to go, for example, from a sine wave to a very complex waveform with lots of inharmonic partials by way of interpolating the wavetable forms. The two oscillators can work in different modes: Additive Synthesis, Ring Modulation, Amplitude Modulation, and Frequency Modulation. To save time and space, let's just say that all parameters can be modulated by two sources. The following modules are common to both engines, sampler and synth. After the sound generation comes the dual-stage distortion module, which offers six different types of distortion (Warm, Transistor, Hard, Digital, Raw, and Aliasing) with rate and low/high balance controls. Then you have a filter (which can be set pre-distortion) with three different types: New York, Tokyo and Brickwall. The first two are iZotope creations that reference a couple of legendary filters, while the latter is strictly an in-house design, featuring a very steep slope, as the name implies. The first two are multimode (Low, High and Band-Pass) and resonating, while the latter works only in Low or High-Pass mode, without resonance. Last of all is the Mix module, with Pan and Gain controls. To put all that to work, and choose the two modulation sources, you have four AHDSR envelope generators with curve settings for the duration parameters. These generators are completed by four LFOs, whose waveform can be adjusted with the Shape Slider or they can be used in Sample & Hold mode. The LFOs may be delayed, phase-shifted, synced to the tempo of the host and retriggered. All four generators and LFOs are independent, but you can apply the settings of one Generator to another with a Link button, a very good idea! In other words, with all these sound generation and modulation possibilities, the sound can go from a simple sine wave with the appropriate envelope for a TR-like bass drum to more unusual sounds in the drum machine world. 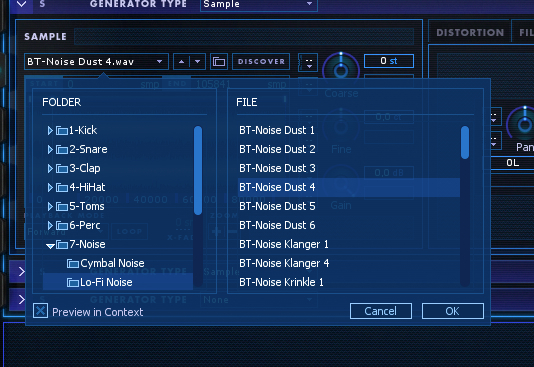 The factory sound library is packed with synthetic sounds, sequences, wobbles, etc. Here are some examples of what you can easily and rapidly achieve with a simple sound. And some effects and synth sounds. The multiple drum kits included reflect very well the possibilities of the software. We noticed certain particular behaviors, but now is not the time to talk about that. Let's move on to the sequencer. As we mentioned before, you have six independent tracks that work according to a default sixteenth-note slicing, which is the basis for two bars that depend on the internal or host tempo. But, with a right click, you can choose any of the multiple time signatures available, from 3/4 to 9/8. Solo, Mute, Pan, Gain ─ it has it all, along with routing possibilities to any of the multiple outputs of BreakTweaker: An ideal solution to process the sound in ways not available on the instrument, like with a full-fledged compressor (the Intensity control on the Master allows you to give some punch to your sound), reverb, delay, etc. An interesting point is that you can load a sound preset directly onto the track that you wish to edit, there's no need to switch to the Generator window. 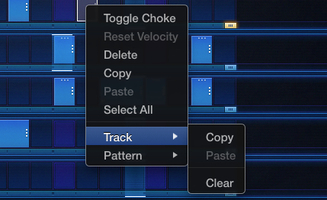 Afterwards, you just have to click on one of the tracks to create a rhythm element, which is placed in one of the slots that correspond to the division chosen. You can stretch it to get a longer sound, choke it (silencing the previous sound) and use all other classic functions (copy, paste, move, erase, etc.). 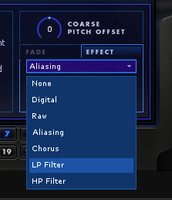 Every Global Preset can store up to 24 different patterns, which you can trigger directly from a MIDI keyboard (just like the individual sounds, obviously). You can work in Gate or Latch mode, with the possibility to turn off Retrigger, which means that, when you play a Pattern and select another one during playback, the latter will start at the place where the cursor is, without going back to the start of the bar. Very nice to create variations live, since the possibilities are endless. Your eyes will then spot the Speed box, which is set to x1 by default. Clicking on it will display all seven available speeds, as multiples or divisions of the original speed (including 2/3 and 3/2). That makes programming way more powerful, especially as each track can have its own playback speed! But the icing on the cake is something we hadn't found except on FXpansion's Tremor, namely the possibility to modify the number of steps per track, for example, 15 steps for the snare, 11 for the kick, etc. Long live instantaneous polyrhythms! Here are some examples stemming from one single Pattern. I nevertheless have some criticisms, and not minor ones. For instance, why is it not possible to see the full tracks when you choose to work with two bars? What's more, there's no zoom, so you have to scroll horizontally to see the rest of the parts/rhythms. Quite inexplicable, given the size of the instrument. Then, if you modify the number of steps in real time, once it reaches an "integer" value, the rhythm remains shifted according to the place where the cursor was when you reset it. On Tremor, the cursor is immediately resynced to the position of the other tracks, which results in a "normal" rhythm. Finally, the last part of the instrument, which constitutes its major innovation: the MicroEdit module. Within this module, all typical modifications introduced by BT and other EDM artists (including all genres and sub-genres of electronic music created only as a way to market them) are done in a software fashion (no more slices nor micro-edits with scissors and fades here and there on the audio material, even if that is still possible. Outside of the plug-in itself, that is...). 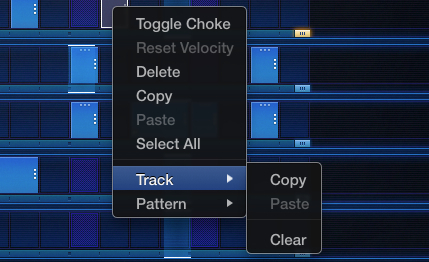 Start by selecting a region of a track (editing is done per regions, which are independent from track to track and even within the same track). Next, process it with one of the Microedit Modes: Speed, Divisions, Pitch, and Time, each of which features a parameter (rhythmic division, number of events, etc.). Then, there's the slope, the shape that you want to give to the processing, allowing you to distribute the microedits with the Tension (skewed to the left or to the right) and Rotate parameters (to shift the phase of the curve). Next is a Gate, with adjustable action, width and duration. 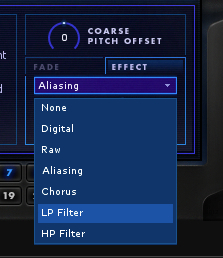 And, lastly, you have Pitch (adjustable in semi-tones), Fades, and an effect that can be chosen from among different distortions, chorus and filters. Plus, you have a Randomize button. It's extremely effective, besides being a very unusual and creative way to work. Here are some examples of simple modifications of the same sound. This drum machine offers very interesting basic functionalities, in addition to rare (polyrhythmic sequencer) and unheard-of (MicroEdit) options. The power of its synthesis engine, together with a nice sample library, make you quickly forget the usability problems (which aren't ordinary for iZotope products). Its only true rival to date in the polyrhythmic sequencer segment is Tremor, which offers very nice features as well, less the MicroEdit mode, one of BreakTweaker assets. However, FXpansion's software ($149, don't forget) doesn't support samples yet, a point where iZotope gives total freedom to the user. 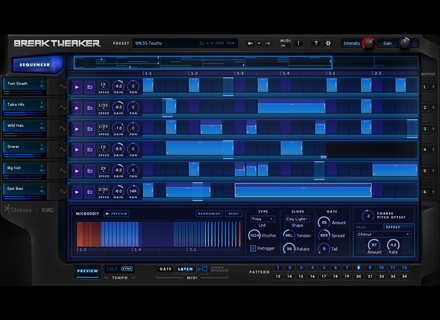 Considering its features, BreakTweaker may be the drum machine to have for EDM, if the price is not an obstacle, of course. Both the finesses of its programming and the rich sound it puts at your fingertips set the bar pretty high. In any case, its creative potential promises lots of hours of creativity, in the hope that its capabilities open the door to more than just 4/4 at 140 BPM.